I do have a few Tilahun jokes as well, which I would like to share with you guys but since it doesn’t translate that well, I might just podcast. Published by Nolawi April 20th, 2009	in Current Issues, History, Music and Noteworthy. TILEYÉ…LOVED LOVED LOVED HIM. MY ALL TIME FAVORATE. HIS GRACE, HIS VOICE, EVERYTHING. MAY HE REST IN PEACE. Thank you Nolawi for the post!!!! Dimtsu anjeten bibelagnim…. loving the moves! Wow, a legend indeed. He has transformed the music industry and been a leader for several decades. That unique voice…WOW. First time I saw him live was in Denver and got a chance to jump on stage and take a picture with him…it was amazing. I love Tilahun’s songs – specially the not so famous ones . My favorite one is ” Lanchi biye “. Definitely an undisputed king of modern Ethiopian music. He hasn’t actually died. We can hear him anytime, anyday. He will live forever through his music. eweeeeeey! beTam sad! May God bless his soul. RIP Tilahun..Ethiopia lost a big one this time. No one will ever take his place. May God bless his soul!! He is the legend of Ethiopian music. Thanks for giving us a forum to express our condolence. It’s a sad day. R.I.P. Tilish! May god bless his soul! Greatest of all time indeed. God rest his soul in peace, he will be missed..
1- Abareh belew yanen ametsenga tegentaye wonbedae! 2- Atentame yikesekese demame yefeseselat! 5- then all the rest of gazillion zefens that he sang…he sang preety much about everything. Still the firts and the last!! God Bless your soul, Tilahun. We and your country miss you. ENDESU YALE MANIM YELEM….THE PHENOMENAL!! may he rest in peace, this is indeed sad. Word can’t describe the sense of loss in the Ethiopian Modern History. He was a Nationalist, Patriotic, Lover and Father. We heard it all though his music. I say for his funeral just play “Tenfashe Tekerso Yekemet Malkesha”, cause that songs describes everything about him and he sang for this day, that DAY is here. I am in such shock, wish I can take it all back, but he is in God’s hand now. Egzibher Amlake Nefse Yemar! We love you Telish, your songs will always remain in my heart. I LOVe artist Dr. Tilahun gessesse forever and ever! I will miss him forever! He is my one and only one. I know everyone loves him but i love him the most I think. LOL! we lost our gold we will never get another one! BTW please don’t call him tilish! My sister calls him that i can’t stand her for it thank u. .our god give to good. rest solu of .our artist..father all to them ecsebit .ethiopians .artist. d/r tilahun gesese. i should go and see ethiojazz aydel..
yes I have never seen Tilahun live performance. I always thought i will get to see him one day. well, well…Nefse YemaR..my fav. cd is his last remixed cd called “AnDande NEgEROch”….ethio jazz will know this cd. 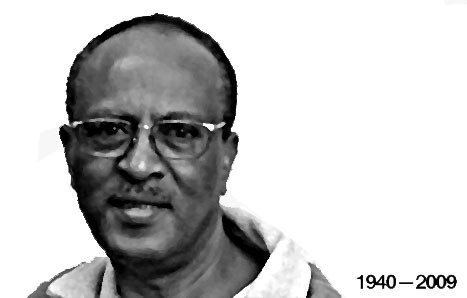 Honoring Tilahun Gesesse — This is to let folks in the Washington, DC area who know, love and mourn Doctor Tilahun Gesesse that you can pay your respect and condolences between the period 4/21/09 (Tuesday) to 4/23/09 (Thursday) at 901 S. Highland Street, Arlington, VA 22204. This information from Art-topia. Please visit and spread the word. Pray for the family and the people of Ethiopia. I am sure Ethiopians, more so those of us Addis Ababans are saddened by the legend’s death. Reason? Tilhun’s songs are timeless. There is NO argument there. Many talented sang but no one defied the culture on the stage, as Tilahun did. Be it pouring his emotions in a society that portrays itself as macho or being flirtous or dictator on the stage in front of the eyes of a society that walks itself in a tight societal norm. YET, Tilhaun got away literally with everything. He used his art, charm, confidence, machoness and talent. For this, I take my hats off for his defiant nature. He lived thru inner freedom. His songs are timeless and boundariless, even my Eritrean relatives of his generation & derg era generation of my Eritrean friends own his albums. His body language on the stage that dictated that he was in control was enviable. He earned everything thru his defiant attitude, his charm, his confidence, his art, his talent and the rest was HISTORY! the country & society, especially, the urbanites gave in. No doubt in my mind that those of us who are against any sort of control, be it parental, cultural, governmental or societal, envied his persona, stage attitude even if we might not like his arrogance. Because he had the ability to sniff those barriers and systematically attenuted them to his advantage that allowed him to be who he was and to extracting his potential to the max. That is what each of us individuals deserve to have. I, as a human being, can’t be happier for him for the fact that he was able to exercise that and became an image that could be emulated. what an artist, a defiant that is ! His songs were expressed in a higher but comprehendable form of linguastic and art. He, long before he died, left a FOOTPRINT to the Heart of millions. I have nothing but deep respect and admiration for his ability to defy our collective mindset and cultural obligation while mainting in tact who he truly was. That is Classy ! simply ART & STYLE swinging in a pendulum of aching beauty! I simply had misty eyes, and aching heart and for sure the same with most of the crowd,(many women visibly sobbed) when we saw him in Oakland, CA in Jan 2007 with his defiant attitude to entertain while strapped unwillingly to his wheel-chair. it was hard to look to a man that dictated a stage. It was hard to look at a man that defied societal norm & expression. it was … it really was. A man who defy control was controlled by noone but nature. He refused to bow. His defiant tone, his still captivating voice… echoing a song that defied a room that was poorly equipped by sound abosorbers and sound system. He, as usual, albeit some unhappy look, marched on with the thing that he always did best. ..and we followed… I said to myself, what a waste, those of us who did nothing to contribute. what a waste to live & leave. what a waste! I am happy for him for the fact that Africa’s land was merciful & a blessing to him. For he DIDn’t UNHOOK his eyes from the opportunity, conducive environ & prize, that many Ethiopians (Africans) didn’t/don’t do and for that he was rewarded with what he earned…and for that, as a human being, not just a fan, I am the happiest person for him that he didn’t die in vain like the rest of us millions, billions. He didn’t live doing nothng. what a blessing! it was a purposeful life. May you, a blessed human being & a contributor, RIP! symbolic end of an era for generation of Ethiopians. Though most Ethiopians then were impoverished without the material wealth we are accustomed to see now, still people’s life was meaningful with simple pleasures or passion filled thanks to the beautiful voice of young Tilahun or his vocalsit friends and the talents of unparalelled songwriters as well as composers. His death is a reminder that innocent time in which these talented musicians made us one people is gone forever. That seems to be what people in his funeral lamented more than their idol. The decade when Tilahun and the Imperial Guard Band ruled was the golden era of Ethiopian music where the best in songwriting such as Sahle Degago, Tsefaye Lemma etc, the best in composing such as Nerses Nalbandian (Ethiopian of Armenian origin), Lemma Demissew as well as the best in vocals such as Tilahun, Mahmoud, Bizunesh & Hirut Bekele found each other to produce the best of the best, music and shows in Ethiopia. Unlike the ones we see in Ethiopian music industry in current times, the drive for Tilhaun and his then colleagues was not money. That is why in most cases their talent and fame did not translate to financial wealth. Their drive was to give their best to their adoring fans. As Tilahun said in one of his interviews, the only wealth he and his colleagues carry to their burial is the love and passsion of Ethiopians shown to them and to their music. Ethiopians from all its corners and terrains loved Tilahun or his colleagues and the music they were listening to during that golden period. This is a fact even Meles or Issayas would hate to admit. Would it be suprising, if they admit that they loved his songs though they hated his passion for the unity & integrity of his country. Ethio-Jazz had excellent articles here in this blog on the Bands that follow the Ethiopian Music Golden Era, I am hoping that EJ would use this opportunity to share with us the Ethiopian Music history prior to 1961.
dude…you cound’t find a better picture than that?…. what is sad is that no one took some decent photos in his last years..
there are good shots from like 20 years ago though.. but i dont think that is enough..
significava sostantivo in universale). Nell’ambito della semantica, il sinonimo indica due lessemi con la medesima accezione. Il sinonimo ? l’opposto di contrario (soprannominato anche “antonimia”). quest’ultima non pu? giammai considerarsi assoluta. In realt? la attinenza tra il pensiero, il suo correlativo puro significante e la referenza paralinguistica restano unici per ogni voce. Come sinonimia si pu? cogliere altres? quella originale forma retorica con la quale si comunica il medesimo proposito impiegando parole con senso affine, cio? utilizzando o sinonimi, appunto, o la cosiddetta allegoria. In quest’ultima circostanza non si ottiene, tuttavia, una affinit? perfetta di accezione, invece una corrispondenza; la mutazione stessa, percepire e seguire, vigilare e assistere, rende pi? indubbio l’impiego magniloquente della tecnica sinonimica. Molte importanti figure retoriche, come la esagerazione, la perifrasi, l’enfasi delle ripetizioni, fanno ripetutamente appello alla sinonimia, in dettaglio nella climax anticlimax, dove rudimenti della iterazione sono generalmente sinonimi. Check with your lender to see what is required and what is optional. With the help of home loans, you can have access to large amount of funds. However, the natives combine it with African dialects and what has resulted is a language that is truly unique and decidedly Jamaican. Her syndicated radio program, Music Highway Radio, airs on over 700 affiliates to more than 126 million listeners. But after figuring out the games in LA, I had this ‘a-ha’ moment when I didn’t feel like I was doing what I was supposed to be doing. An individual in essence lend a hand for making significantly blogposts I would declare Debt Consolidation Remortgage ,Debt Consolidation Remortgages ,. This is the beginer My spouse and i visited your web site and for that reason far? My partner and i impressed using the homework you have made to produce this particular write-up amazing. Excellent activity! blogger. I have joined your rss feed and sit up for seeking more of your excellent post. The greatest of men are men on best. Many thanks for another excellent posting. The best place else could possibly anyone have that style of information in such a great technique of creating? For sale powerpoint presentation in the future, using this program Best Loan Uk, Best Loans UK,. for the seek out such information. I became suggested this blog through my relative. Now i’m don’t constructive whether that create is published by technique of the pup seeing that who else understand such specific about the dilemma. You happen to be incredible! Thank you so much! Pretty wonderful publish. I simply stumbled upon your blog post as well as wished to mention that I’ve got truly beloved exploring your website articles Remortgage Online quote, Remortgage Online Quotes,. Of course We are opting-in on your rss feed and i’m wanting you’re one more time quickly! Oi, gostei extraordinariamente do seu tema! blog no mesmo tipo de conte?do e gostaria de ver se voc? tem alguma sugest?o para quem est? come?ando a postar arrigos sobre este tema. abra?os! I like reading a pozt that will make people think. Also, thahk youu for permitting me to comment! on your post is just great and that i can assume you are a professional in this subject. The heart of your writing while appearing agreeable initially, did not work properly with me personally after some time. Somewhere within the paragraphs you actually were able to make me a believer but just for a while. I still have a problem with your jumps in assumptions and one might do nicely to help fill in all those gaps. If you actually can accomplish that, I would definitely end up being impressed. 10/1/2016 @ 15:54:17:Well done bernos.com! Solid, well-researched content. I just passed this on 10/22/2016 to a coworker who’s been involved in some work of his own on the topic. To say thanks, she just bought me lunch! So, I guess I should say: Cheers for the drink! Love the site– very easy to navigate and lots to consider! Quite a good read. I just passed this on 10/31/2016 to a colleague who has been doing some work of her own on this topic. To say thanks, they just bought me a drink! So, let me express my gratitude by saying: Thank you for the drink! before. So wonderful to find another person with some gwnuine thoughtss on this topic. Looking for WOW gold cheap? Co goldraiditem me to gold.raiditem! Huge stock, 100% safe, fast delivery and top service await you here! Besides,goldraiditem, FIFA 17 coins, FFXIV gil, NBA 2K17 MT, SWTOR credits, D3 service, BNS gold, and RS gold with low price are provided to you guys!